The £49.99 RedEye Mini Universal Remote for iPhone and iPad is something that couch potatoes who thrive on iDevices might have been waiting for, as this pretty interesting gizmo can be plugged into the iPhone or iPad’s headphone socket, giving you instant control over the TV, stereo system, Sky/digibox, DVD player or virtually any other device that receives its command from IR signals. Boasting a range of up to 30 feet, it ought to be more than enough for just about any kind of living room unless you live in a palatial mansion, that is. The RedEye Mini doesn’t need batteries since it acts as a parasite to your iDevice when connected, resulting in one less charger to tote around on your travels. 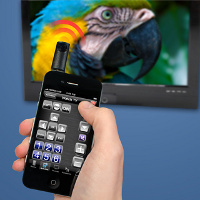 With its online IR code database, you can even gain control of devices even if you don’t have the original remote to hand. Could this be perfect to pull off another Gizmodo-like TV prank at this year’s CES?